Direct ownership means the nonprofit will purchase the system for its building or property and will own all of its electrical output. Direct ownership of a system makes sense for your organization if you are able to raise funds to cover the cost of the project, offer cash up front, or get access to specific state incentives and grants. Under third-party ownership, a separate entity (such as a solar developer or a group of community investors) owns and operates the solar system on behalf of the organization. The organization then pays the third party for the monthly electricity produced by the solar system. Many nonprofits prefer third-party ownership because they lack the upfront cash and/or the financing abilities to purchase their system outright. Note: Third-party ownership is only available in certain states. Find out where. 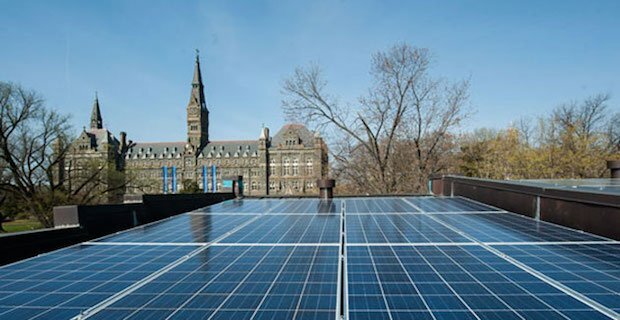 Solar panels sit atop a Georgetown University campus roof. Tax-exempt status: Due to their tax-exempt status, nonprofits are not eligible to apply the 30 percent federal tax credit to their solar installations. To leverage the full value of the federal tax credit, these organizations can install their systems through solar financiers or third parties who will be able to monetize the tax credit and incorporate those savings into the final price. Ability to fundraise via grants and donations: Nonprofit organizations are uniquely suited to go solar because they often have dedicated members eager to help fundraise and donate. An often-overlooked expense for nonprofit organizations is electricity. By helping their organization go solar, members can contribute to lasting electricity bill savings. Over time, those savings really add up. Community engagement: Nonprofits are always looking for ways to engage their members and supporters. When going solar, we believe nonprofits can create unique opportunities for members to get involved with fundraising, designing, and education as it related to the solar installation. Solar United Neighbors has helped many nonprofits go solar and can guide your organization through solar-related member engagement. Blessing ceremony for a solar system at St. Alban’s Episcopal Church in Washington, D.C.
Nonprofits that may not be able to go solar on their own can partner with Solar United Neighbors to launch a local solar co-op for their members. Solar co-ops bring together interested homeowners and business owners, educate them about solar, and leverage their bulk purchasing power to secure the most competitive installation pricing in the area. Community-owned PPAs are entail a community creating a third-party entity to own the system on behalf of the organization. This will allow it to take advantage of tax incentives. This third-party entity (made up of community members) owns and operates the solar system. The organization then pays this entity for the electricity produced by the panels on its building. The benefit of a community-owned PPA is that members of the community can support a solar project financially while still earning a modest return on their investment. Sidwell Friends School in Washington, D.C. teamed up with Common Cents Solar of Chevy Chase to install 120 solar panels on its gym roof. To fund the $200,000 project cost, members of Sidwell Friends community were invited to purchase solar bonds in increments of $5,000, on which they earned interest for 10 years. Sidwell Friends purchases the solar electricity at fixed rates that protect it against inflating energy costs. After it finishes repaying the original investors, the school will reap solar energy at no cost for the rest of the predicted 30-year life of the system. A church in University Park, Maryland used the same approach to finance its solar project. If your organization is interested in this model, University Park Solar LLC can provide technical assistance on how to create a third-party entity. 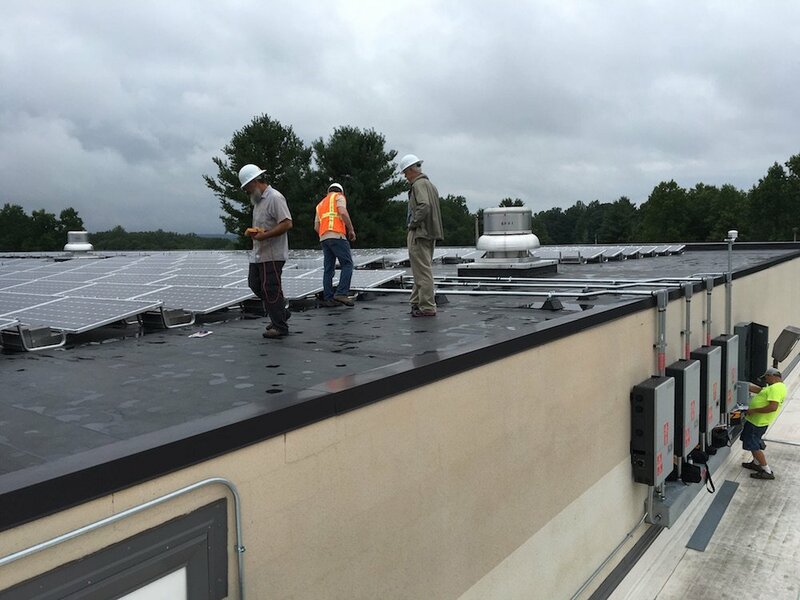 Monticello High School solar installation in Albemarle County, Virginia. Request for Proposals Guide & Template for Nonprofits – This report from the All Points North Foundation outlines steps nonprofits should take when considering solar. Nonprofits: A new frontier for solar – This article highlights the ways nonprofits are going solar around the country. Solar Schools Census – A database of schools that have gone solar compiled by the Energy Foundation. The database is a great way to connect with other schools that have gone solar in your area. Solar 4R Schools – A nonprofit that provides training and resources on solar for educators. 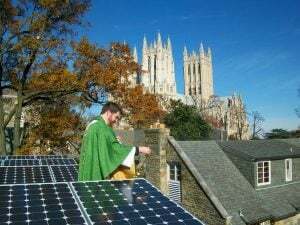 Going Solar for Congregations – A resource guide from Interfaith Power and Light (DC. MD. NoVA). Learning from Solar Congregations – This booklet tells the stories of 12 congregations in the Washington, D.C. metro area that have gone solar.